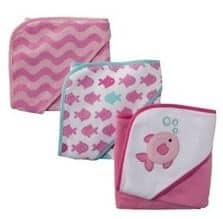 Right now at Target you can purchase this Circo Baby 3 Pack Knit Hooded Towel Set in Pink for ONLY $4.54 (regularly $12.99)! If you have a Target Red Card (debit or credit) you get an additional 5% off making these $4.31 and they will ship for FREE! If you've been looking for Hooded Towels then you won't find a price better then this. Make sure to grab yours before they are gone!